British rockers Mumford & Sons have played the first concert at New York's Forest Hills stadium in Queens - which once hosted acts from Jimi Hendrix to the Rolling Stones - in more than 20 years. The Grammy-winning band performed at a sell-out concert for 16,000 fans at the stadium's West Side Tennis Club, which hosted the US Open until 1978. The band even showed some athleticism - the foursome played tennis on stage - using a racket at times, and a guitar and banjo at others. They also threw balls to fans in the crowd. Mumford & Sons electrified the crowd, even when it rained lightly, playing the well-known rock hits Little Lion Man, I Will Wait and The Cave, as well as other songs from their two multi-platinum albums. "Yes, Forest Hills, Queens, New York. We just can't believe you all came. This is amazing," keyboardist Ben Lovett said. "We were like, 'Are you sure you can invite 17,000 people to a tennis court?' It hasn't happened in a long time." The venue's prime ended when the Open moved three miles away to Flushing Meadows and its days as a music venue - where Barbra Streisand, Frank Sinatra and Bob Dylan also performed - faded amid complaints from neighbours about noise, crowds and cars parking on residential roads. But the streets were packed as thousands headed into the stadium, with police guiding cars and people. Mumford & Sons and the crowd were loud, but not unruly during the two-hour show. The band played their folk-rock tunes with ease, and at times slowed things down as red-orange lights shined and small lightbulb hung in the air. They were like mad scientists during Dustbowl Dance - singer Marcus Mumford was now on the drums and he kicked it out of his way as he headed to the front of the stage to finish singing the song. Lovett - on the piano - matched his energy, throwing things around and earning cheers from the crowd. When singing Winter Winds, Mumford even forgot some of the words, and shouted an expletive as the crowd roared and sang it for him. "We're really proud we're here to revitalise this venue," Mumford said before singing the closer, The Cave. 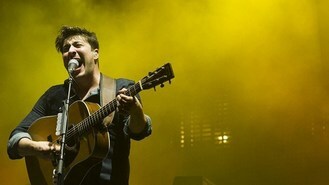 Mumford & Sons' second album, Babel, won the Grammy Award for album of the year this year. P Diddy has denied reports that he had a fight with rapper J Cole at his MTV Video Music Awards after-party, saying they are "friends. Timbaland has hinted that new Michael Jackson music could be released. Justin Timberlake put his media tour on hold to meet a young girl who survived brain surgery. Fisherman's Friends are on course to enter the record books this weekend - with the oldest boyband member to perform on a top-20 album. The Pet Shop Boys are to conclude their global tour by headlining one of the world's biggest New Year celebrations. Dane Bowers and the rest of boyband Another Level are reportedly planning to reform. Charli XCX has written a new song for Britney Spears' new album. Eminem has unveiled a new single Berzerk, after revealing a teaser of his new album MMLP2. Wretch 32 has revealed he can handle most on-stage malfunctions now - because he has experienced so many.